Second hand and used Baby Prams for sale in your area. All of the top items on the best UK second hand classified and auction sites in one place. Preowned iCandy Peach 3 travel system in truffle, suitable from birth to 3 years with packaging and instruction manual. Includes: pushchair and seat unit, parent or world facing carrycot suitable to..
Used but in excellent order. Includes car seat with compatible isofix base, carry cot, seat for when baby is older includes blue footmuff (not pictured). 5 years old, this pushchair and car seat is in really good condition. We had a second child quickly soon after the first so bought a pushchair for two children hence this one having only low 'miles'. Grey Buggy Stroller Pram 3 in 1 Travel System Pushchair with Carry Cot TecTake. This travel has served my little boy very well! I really can?t fault anything with it at all. So easy to attach car seat with its one click system, 4 height adjustment recline on main seat is easy to. Excellent condition, includes car seat from birth, carry cot pram accessory, 2 way facing pushchair accessory and wheel frame. Easy to assemble/ swap accessory etc. PURCHASED NEW SILVERCROSS WAYFARER & used for 1 child till 9 months old as a second pram at Grandparents house. VERY GOOD CLEAN CONDITION! SMOKE & PETFREE HOME THE CARRYCOT - PRAM, with apron, hardly. 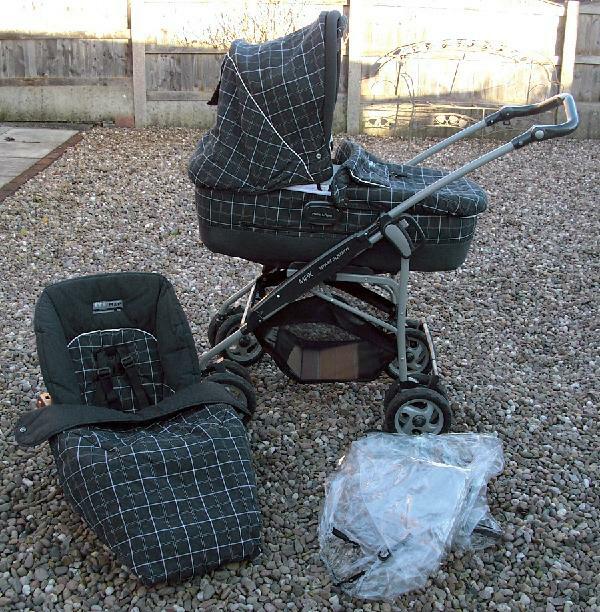 In excellent condition comes with carrycot car seat push chair and adapters and cup holder changing bag and waterproof cover all been steam cleaned and ready to go car seat and carrycot from birth up. Cosatto travel system use from birth to age 3. In good condition. Not really used a lot due to having a car. Comes from no smoking home. It has full instruction manual and still under guarantee until. 3 in 1 travel system in a used condition but still lots of life left. Comes with changing bag and mat, isofix and 2 diff raincovers. Quality baby/toddler travel system which includes pushchair, carrycot and car seat base, but no car seat. There are also a number of associated accessories. Cost nearly Â£800 new, but bit faded in..
Infrequently used. In great condition.Collection only from NW8, near St. John's Wood tube station. Pram 3 in 1 travel system used. Condition is Used. Pushchair with car seat and mount and carry cot some wear and tear but all still in good condition perfect for new parents. Everything you will need as pram / buggy from newborn to at least 3 years old, for summer and winter!! Lots of items included in this price! All the parts of the pram are easy to interchange and the..
Silver cross Wayfarer Beige Travel System Pram. Condition is Used. Collection in person only. Baby Pram Stroller Pushchair Carrycot Travel System Buggy. Condition is Used. Collection in person only. Selling my venicci travel system * Comes with the carry cot and toddler seat, rain cover and the matching bag. Also has the cup holder. It?s in good condition, the only reason I?m selling is because..
Bebecar Ip Op Evolution Special edition Pram Navy Cream 3 In 1 Travel System. Condition is Used. Barely used in exceptional condition. LESS THAN 1 YEAR OLD - EXCELLENT CONDITION FROM SMOKE FREE HOME. Royal Blue Mothercare 4 wheel journey travel system with group 0+ car seat & convertible pram to pushchair seat. Car seat suitable 0-6. Selling my Nuna Mixx Suited Edition Travel system with Joie Igemm carseat & Isofix. Purchased in January 2018, but didnt use until baby was born in July 18. Excellent condition. Nuna Mixx All-terrain. VENICCI - Pram 3 in 1 Travel System - Denim Grey - used condition. Condition is Used. Collection in person only. Beautiful Dolls travel set with pram and push chair combination, whilst this is used it has not been played with much. you can easy clip the two different bases on. The handle can be up or down. This lovely pram is in good clean condition and includes toddler seat, newborn carrycot, 2 mattresses and 2 rain covers for both carrycot and toddler seat. black Graco travel system lovely clean pram one hand to fold and light and easy to monover ( pictures for reference only as actual pram in storage) has pram, carry cot insert car seat and 2 car seat..
Mothercare Curve complete travel system. Car seat base stays in car so car seat just clips in and out in seconds. Car seat attaches to pushchair. Pushchair can be used without car seat having a multi.